Several years ago, Fiona was the only survivor of the Red Scarf serial killer, who shot and killed Fiona’s cop fiancé and his K-9 partner. On Orcas Island, Fiona found the peace and solitude she needed to rebuild her life. But all that changes on the day Simon Doyle barrels up her drive, desperate for her help. He’s the reluctant owner of an out-of-control puppy, foisted upon him by his mother. Jaws has eaten through Simon’s house, and he’s at his wit’s end. To Fiona, Jaws is nothing she can’t handle. Simon, however, is another matter. A newcomer to Orcas, he’s a rugged and intensely private artist, known for the exquisite furniture he creates from wood. Simon never wanted a puppy-and he most definitely doesn’t want a woman. Besides, the lanky redhead is not his type. But tell that to his hormones. When I decided to read this book for a review early on this week, I thought to myself that it’s going to be an easy review. I’ve read many of her books and her series under JD Robb is one of my favourite series. I’ve got to say that I prefer her JD Robb books over her NR books because I have found some of the NR trilogies to be formulaic. This book had all of the elements going for it. I liked the heroine, Fiona “Fee” and the hero Simon. I also loved the dogs, and Jaws, the puppy. So why did I find myself bored reading this book? Why am I marking it as 2 stars? This is a NR book! Surely a veteran author in her calibre can deliver better? 1) I found it to be formulaic and predictable. I could see who was going to be the last victim as soon as that person has been introduced in the scene. It’s a clear set up. I didn’t need to read the whole book (but I had to, so that I could write this review) and I could predict the whole story, and I promise you, I am no writer. My imagination is very limited. The friendship between Fee, Mai and Syl feels staged. Nothing exciting or out of ordinary made me feel “wow! I didn’t see that coming”. 2) I felt the book was dumbed-down. Okay, you don’t need to be a brain surgeon to read a summer romance but really, do I need every single reaction from the hero/heroine explained to me? Dumbed-down -> reader = grumpy, disappointed and bored reader. The setting is like a Stepford town, almost everyone has (and loves) dogs. Also, Simon’s character is a little confused, swinging heavily between “bloke-ish” and heavily metrosexual (stretching passed artistic insight). It wasn’t a murder mystery either, since you’re told outright who the baddies are. Her bedroom, he thought, showed a strong, imaginative use of color. The walls glowed a coppery hue in the sunlight and formed a good backdrop for some decent local art-probably picked up at Syl’s. She’d indulged herself with a big iron bed with hints of dark bronze along with that copper, and high, knobbed posts. No fuss, he thought. Even the obligatory female bottles and bowls on the dresser had a sense of organization, while the trio of dog beds across the room spoke of her passion and profession. Attractive lamps, simple in style, and oversized chair draped with a beautifully made throw-likely Syl’s again. A low cabinet holding books-and he’d bet they were shelved alphabetically-photos, trinkets. 3) There are so many self-analyses and psychoanalyses which are over explained in the book. I know that this might be overlapping with point 2, but this book is so full of them that it deserves its own point. This is what I believe killed the romance. I wish it could be as hot as Eve and Roarke, but it’s sadly not. Oh well, at least the people in the book thought it was hot, even if this reader disagrees. See, you give the impression you don’t pay all that much attention, just aren’t interested enough. But you do pay attention. Not big on the interacting, but you take the in the details. It’s kind of sneaky, really. I like you. Or at least I think I do. I don’t know much about you because you don’t talk about yourself. I know you have a dog because your mother gave him to you, which tells me you love your mother or fear her wrath. It’s probably a combination of both. There are 2 stars left because the book is not all bad. It is well written and Nora has done her homework with canine search and rescue training. There were some amusing moments involving the dogs, and I especially enjoyed the scene where Fee was conducting a behavioural correction class with the spoiled Pom, Chloe, and her owner, Lissy. So, I give it 2 stars for a vanilla novel from an experienced author. It will be a while before I pick up a NR book again. 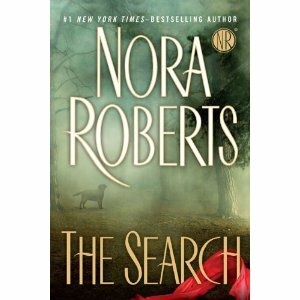 Search by Nora Roberts: This was (and still is) one of the most boring so-called “thrillers” I have ever had the misfortune to buy and read. If I had wanted a book on training dogs and search and rescue I think I would have bought one. Didn’t care what happened to the “heroine” by the time I had plodded through God knows how many pages of needless, repetitive prose to get to any thrilling bits. I will avoid this author at all costs in future.